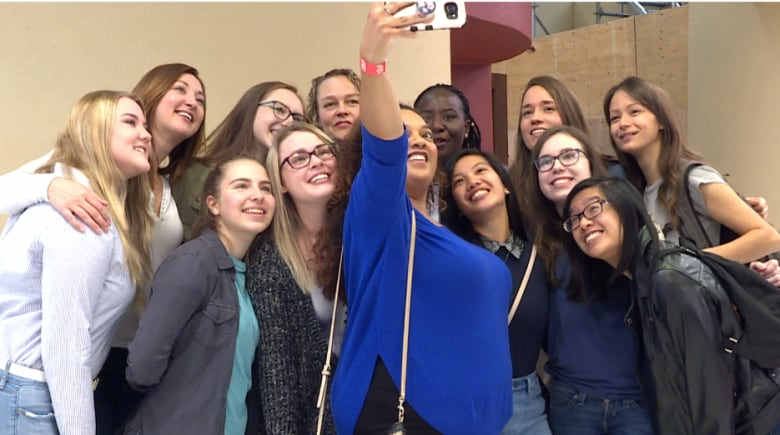 A Calgary student trying to track down a missed connection inadvertently helped a group of women with the same name make friends. 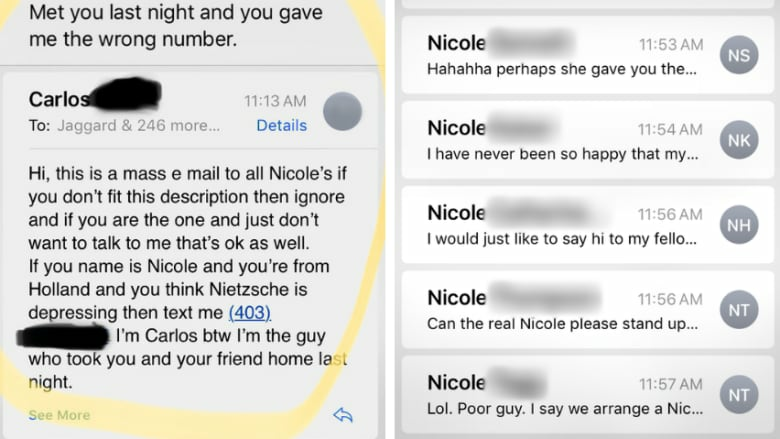 He met her at a bar, but she only gave him her first name — Nicole — and the wrong number. But Carlos Zetina wasn't deterred, and decided to try to track down his missed connection. On Friday he wrote an email with the subject line "Met you last night and you gave me the wrong number," and sent it to every Nicole, Nicky, Nikki, Nicolette and even Nik at the University of Calgary — all 246 of them, he says. 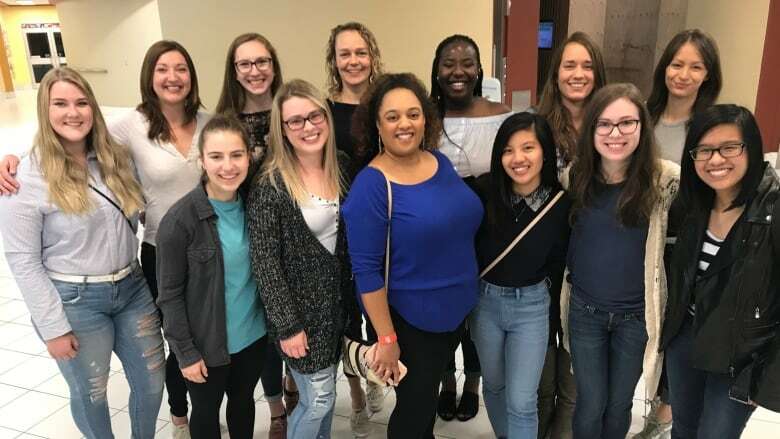 The email didn't immediately reconnect Zetina and the original Nicole — but it did connect the rest of the women, who bonded over the odd situation and decided to meet up on Friday. When she saw the first email Friday morning Nicolette Riley chuckled, as the night before was "ThursDen" — the party night at The Den, an on-campus bar. And then, the responses started coming in from other Nicoles. "When the emails started rolling through I was just so excited, it instantly made me feel less lonely on campus," said Riley. "And now we're a group! It's great." Zetina said the university's email had a directory, so it only took him a few minutes to copy anyone with Nicole in their name to the message. "I didn't want her to think I was a bad guy for not texting her, she did give me her number," he said of why he decided to send the email. Some Nicoles were students, some alumni, and some faculty — an associate dean was even included on the list. "There's a researcher in the group, who, she and I have similar research interests, so we're actually going to collaborate in future," said Nicole Thompson. "I think it's fantastic." "It's just kind of nice to have something unexpected in life happen … it's just really nice uniting with some really great, smart, fun, interesting Nicoles. It was a bit of a bold, interesting move, Carlos, but thanks," said Nicolette Little. The email's intended target wrote in a post to the group that the "powerful network of Nicoles" informed her about the situation. The Nicoles have started a Facebook group to keep in touch, titled "Nicole from last night" and are talking about having a monthly meetup. Many of them are looking forward to meeting the woman they've taken to calling "the real Nicole." The real Nicole said Zetina must have typed her number in wrong. "I'm not embarrassed. It's just funny how much it got out of hand," she said. She never received the email, as she's an exchange student, but heard about it from another Nicole at the school. Thompson said she spoke with the original Nicole and put her in touch with Zetina, who she said described himself as a "hopeless romantic." "He had a connection with this woman and I guess she felt it too — so it's kind of the perfect ending to this," Thompson said. Nicole said she plans on meeting for coffee with Carlos, but just as friends. There's also one more Nicole who could possibly join the club. "My ex-girlfriend's name was Nicole," said Zetina. With files from Dave Dormer, Anis Heydari, Elizabeth Withey and The Canadian Press.